Apple makes a lot of noise about Safari's speed, but when it comes to features, it's on a hiding to nothing. Although the latest version of Apple's browser was a fairly major update, most of the new features had long since been offered in other browsers - for example, Safari's Smart Address Field apes Firefox's Awesome Bar, and the Top Sites view resembles Opera's Speed Dial. More damning is the fact Safari still lacks important features that users of others browsers take for granted. So, we've unearthed the best add-ons that enable Mac OS X users to turn Apple's smart, efficient, beautiful browser into one that's feature-packed as well. If you've a dozen tabs open and Safari does a nose-dive, they're gone. You might get the sites back via your history, but you'll waste time doing so. If you've got Glims (free) installed, its oddly named 'Tabs Misc.' preferences section provides various options for restoring tabs on a Safari relaunch. How many times have you closed a tab by mistake in Safari, yelled something suitably rude, and then had to fish the site out of your browser history? 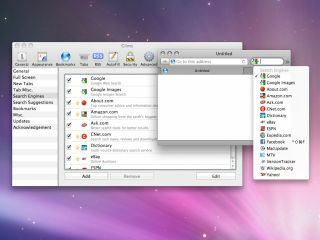 Glims provides multiple undo for closed tabs via the standard Mac OS X undo shortcut, Command+Z. If only Safari had a single-click 'block ads' option, like Camino. Sadly, it doesn't, but GlimmerBlocker (free) even beats Camino for disabling ads. It's extensible, works for all browsers utilising Apple's network settings, and since it's not a hack, Safari's stability is never compromised. ClickToFlash (free) blocks Flash, the number-one cause of Safari crashes. A single click loads each piece of blocked Flash content, an option enables sIFR type to be loaded by default, and a white list enables you to allow Flash on specific websites. Although Right Zoom provides system-wide Windows-like window maximisation when a zoom button is clicked in Mac OS X, anyone wanting that functionality for Safari alone can get it using Glims. Press Shift+Command+M or go to Safari > Max Window Size. If maximised windows aren't enough for you, Glims can take things further by providing full-screen browsing. Its Full Screen options enable you to define which browser window components are shown in this mode, and the menu bar is still available by moving the mouse to the very top of the screen, whereupon the menu slides down.